Fulgencio Batista Zaldívar was born in Banes, in the province of Oriente, Cuba, January 16, 1901, to Belisario Batista and Carmela Zaldívar, sugar plantation laborers. Of very humble origins, Batista worked from an early age. An avid reader, he attended public school and Colegio Los Amigos, an American Quaker school, but was primarily a self-educated man. He held a few jobs and in 1921 he joined the Cuban Army. By 1932, he was a military court stenographer with the rank of sergeant major. The effects of the Great Depression, combined with discontent with President Machado's government, led to violent riots which caused Machado to leave the country in 1933. On September 4 of that year Batista led the so called “sergeant’s revolt”, taking control of the Army under a series of short lived governments. As "Jefe del Estado Mayor del Ejército" (Army Chief of Staff) for the next seven years, Batista increased the size and consolidated the power of the army and suppressed a number of uprisings. In October of 1940, in the first elections after the inception of a new constitution, Batista was elected president. Succeeded by Ramón Grau San Martín, who won the 1944 elections, Batista left the country. In the 1948 elections in which Carlos Prío Socarrás was elected president Batista, still living in the United States, was elected senator for the province of Las Villas. On March 10, 1952 Batista staged a military coup overthrowing the Prío presidency. His past democratic and pro-labor tendencies won him support from the financial sector and labor leaders. Among the opponents was Fidel Castro, who led an attack against the Moncada army installation in Santiago de Cuba in a failed attempt to overthrow Batista’s government on July 26, 1953. Castro was captured, brought to trial and sentenced to 15 years in prison. A year later Batista was again elected president. During the following years, post War economic prosperity grew to unprecedented levels. But growing opposition escalated to social unrest and violence. Castro, who was in exile after being freed in the 1955 amnesty, returned to Cuba and after another failed attack retreated to the mountains to wage a guerrilla war. By 1958 the general situation of the country had become difficult, opposition forces had grown in size and won a number of victories, and some of Batista’s officials had deserted. On January 1, 1959, Batista resigned and flew to the Dominican Republic. In August of the same year, Batista moved to Portugal where he resided until his death in Marbella, Spain, on August 6, 1973. During those years he wrote extensively and corresponded with prominent literary and political figures including both former allies and adversaries. The bulk of the collection consists of correspondence with Cuban government and military officials, some prior to 1959, and with prominent political and literary figures. The collection also includes manuscripts of an unpublished autobiography and other books, as well as published books and pamphlets written by Batista. Other materials include periodicals and books collected by Batista, some inscribed by the authors, as well as photographs of both personal and official nature, memorabilia, and notes and statistics on social and economic conditions in Cuba during the Batista era. 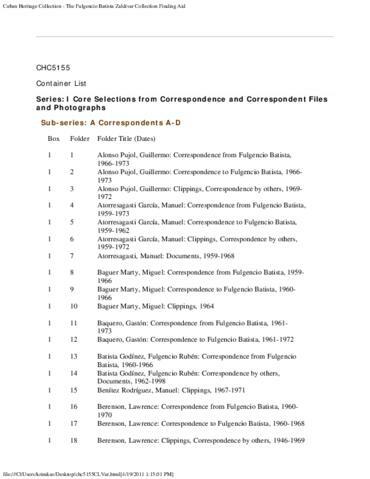 The Fulgencio Batista Zaldívar Collection is organized into seven series by content type. Access to the Fulgencio Batista Zaldívar Collection is unrestricted. Copyright to the collection is retained by the FBZ Foundation. The Following must be approved in writing by the FBZ Foundation: 1) photocopy requests for items found in Series I: Core Selections from Correspondence and Correspondent Files and Photographs; 2) all requests for digital reproductions; and 3) all requests to use materials from this collection for publication, broadcast, or any other uses which can be interpreted as beyond fair use as defined by copyright laws. Researchers visiting the Cuban Heritage Collection can request to see any of the boxes in the Batista collection except boxes 60 and 97 (restricted). Researchers may not request photocopies of anything in Series I (boxes 1 to 6). Researchers may obtain photocopies of anything in boxes 7 through 148 except boxes 60 and 97 (restricted). Researchers may not use a personal digital camera to photograph any part of the Batista collection. All permissions to quote or publish materials from the Batista collection must be approved in writing by the FBZ Archivos Foundation. Researchers interested in digital reproductions of materials from this collection may complete Licensing Application form available at the Reading Room desk. CHC staff will help researchers contact the FBZ Archivos Foundation to request permission to reproduce, quote, and publish materials. Materials in the Fulgencio Batista Zaldivar Collection have been donated by the FBZ Archivos Foundation. Materials related to Fulgencio Batista Zaldivar and found in other collections held by the Cuban Heritage Collection are not subject to the guidelines here outlined. Gift of the Batista family, 2005. Pedro Hernández Lovio Papers (CHC0488), Cuban Heritage Collection, University of Miami Libraries, Coral Gables, Florida. This collection has been processed with the support of the Miami-Dade County Department of Cultural Affairs and the Cultural Affairs Council, the Miami-Dade County Mayor and Board of County Commissioners. Funding also provided by the FBZ Foundation.